The city of Winter Garden, is quietly nestled just south of Lake Apopka, and is quickly becoming one of the hottest places to live in Central Florida. No wonder. The City does everything right. There is a plethora of activities for all the residents, young and old. They offer the best farmers market in the area, on Saturdays, with a large variet y of vendors and musicians. Take a stroll down the red bricks of Plant Street and you will find the small historic Garden Theatre, which was recently restored. There is even a brewery, called the Crooked Can. which makes excellent craft beer. If you are in for a bit of history, take a stroll into the historic Edgewater hotel, which was built in 1927. 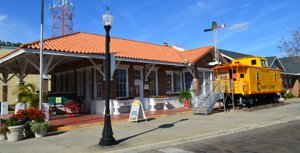 Don't forget to visit the historic Railroad Museum, where you can actually walk into one of the railroad cars which is painted bright yellow. In days gone by, the railroad was the only way Winter Garden stayed connected to the outside world. The railroad still runs through the heart of the city. Don't forget to stop and dine at one of the many eclectic restaurants, stop at the fountain to toss in your coin. And then there is the West Orange Trail where you can walk, run or bike for 22 miles.. As Winter Garden rapidly continues to evolve, new housing options and developments are springing up. . These communities offer excellent access to Disney, the city of Orlando and the Tampa area. Winter Garden certainly has much to offer if your are looking to buy a home., and was also voted one of the best places to live. Once you visit, you will want to call it home too. Lake Roberts Lndg E SubDv. Courtlea Oaks Ph 02b SubDv. K Hovnanian Winding Bay Preserve SubDv. Thinking of selling? Complete the form and see how much your home is worth.